Joel Williamson and his St Lucian opponent from Thursday Kareem Boyce. a successful defence of his Caribbean Bantamweight title and another Gold medal when he comes up against Ajayi Jones of Barbados in tonight’s finals of the third annual Caribbean Championships (formerly Caribbean Development Boxing Championships) at Grois Islet, St Lucia. He led all Guyanese fighters to emphatic victories on their way to appearing in all the finals of the divisions they participate in. All four won by knockout and have done so in all their bouts leading up to the final showdown. Allicock, who hails from Albouystown, won the Bantamweight Gold last year in Barbados to help Guyana retain their team title which they won in the inaugural Championships at home in 2015. 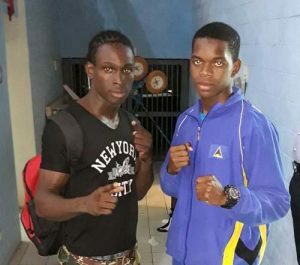 Allicock, a Silver Medallist at the Commonwealth Youth Games in Bahamas earlier this year, will be fighting for Gold tonight as will the other three Guyanese in the smallest Guyana National Boxing team assembled in recent times. On Thursday night Joel Williamson had a second round TKO over St Lucian Kareem Boyce, while St Lucian Nathan Ferreira suffered a similar fate when he came up again Guyana Defence Force’s (GDF) Colin ‘Superman’ Lewis, while Middleweight Desmond Amsterdam knocked out Trinidadian Mickell Joseph to book their places in the final. Tonight’s action will see Allicock fighting Jones, Lewis battling Jessie Jones of Barbados and Williamson face-off with 2014 Commonwealth Games Bronze Medallist Trinidadian Michael Alexander. However, due to lack of funds the Guyana Boxing Association (GBA) could only send a six-man team including four boxers and even if they all capture Gold Medals, Guyana will not be able to accumulate enough points to retain their team title. Former President of St Lucia Boxing Association Joseph ‘Reds’ Perriera said that the standard is good, especially the Guyanese.